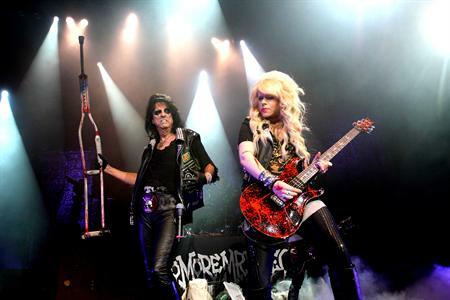 Most people only know axe shredder Orianthi for the company she keeps: Carrie Underwood on the 2009 Grammys, Michael Jackson’s doomed This Is It tour and Alice Cooper’s current jaunt around the world. Still, a feverish fanbase shares one of the best worst-kept-secrets in popular music: the blonde bombshell from Australia has also headlined two the best rock records of the past decade: Violet Journey and Believe Vol. #1 and #2. The blistering guitar-powered trilogy concludes when her Dave Stewart-produced third album, Heaven in this Hell, drops March 12. 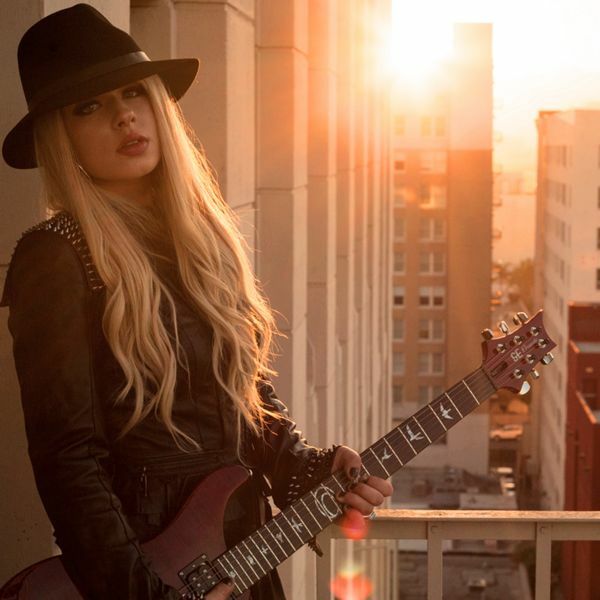 Popdose caught up with Orianthi — Ms. Panagaris if you Wiki — to discuss her new album, the horrors of touring with Alice Cooper and a musical dalliance she once had with Prince and Sheila E.
POPDOSE: Thanks for taking the time to talk to Popdose. Are you calling in from Australia? It’s been more than a year since the Fire EP came out (also produced by Stewart). Heaven in this Hell expands the power of the EP to epic proportions and finally pays off the “guitar goddess” promise of Violet Journey. What inspired you to return to hard rock after two albums (Believe I and II) that were more pop oriented? I felt like I had a lot of artistic freedom on this album after parting ways with Geffen Records. 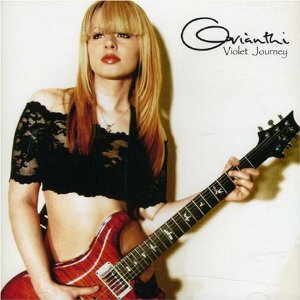 I wanted to make a record that was more bluesy — the way Violet Journey was — not over thought. Dave Stewart is wonderful, we jammed out and wrote songs over the past couple of years. He invited me to Nashville to record at Blackbird Studios — it’s a big room — the energy’s intense. It was more like capturing a performance than recording an album. You and Dave co-wrote the songs on this album? Was Geffen forcing you to be a pop artist on Believe — or was that where you were at the time after working with pop superstars like Carrie Underwood and Michael Jackson? Was there a lot of pressure to have a radio hit? I’m a big pop music fan. I love a good pop song and I want to get on the radio, especially to inspire more girls to pick up a guitar. I felt “According To You” did really well; it got on the radio and went platinum in the US and Australia. The second single (“Shut Up and Kiss Me”) I wasn’t feeling too much — it went too poppy. I wanted the song I wrote with Desmond Child, “Bad News,” to be the second single. There were some rock tracks on that record — “Suffocated,” “Bad News,” “What’s It Gonna Be” — but (the album) kinda went down that poppy path. That’s just not me. I’m more rock/blues. I love pop music and I don’t regret making the album at all. That was me back then and this is me now. Editor’s aside: Believe should have been a way bigger hit than it was — if you like unabashed, radio-friendly, hair metal, power pop records — like Motley Crue’s Dr. Feelgood and James Durbin’s Memories of a Beautiful Disaster –– even the still awesome, Vixen, it’s well worth picking up and playing very loud. How did the tour with Alice Cooper influence the sessions for Heaven in this Hell? Alice Cooper is such a performer, he’s pretty similar to MJ in a way — more rock of course but such an entertainer. He’s very much about his fans and making them happy. He’s got such a great catalog of songs and he’s always changing it up. Once he gets into character, it’s actually scary on stage — knives, balloons, cannons, Frankenstein. It’s a lot like Rocky Horror show, I really enjoyed being a part of it — I had the best seat in the house every night. Were you able to let loose with some guitar solos during the show? All the time — he’s like, go off and solo. I did some long solos during “Eighteen” and “Foxy Lady” — the material we did with Iron Maiden, I’d be soloing on stage for minutes. He loves to bring guitar players on stage: Myself. Ryan Roxy and Tommy Henricksen are great players — we played our parts to make the sound as close to the records as possible. Will your upcoming tour be a big glamorous stage show — or a bluesy jam session? The other night we played as a three piece — it had a very Hendrixy vibe. I was playing a show with Mike Campbell and that was the first time we played the new songs live. Chuck Garric (bassist) from Alice’s band joined us. With these songs, you can break the album down as a three piece or play with a big band. I’d love to take a big band on tour — drums, bongos, back-up singers, a horn section, keyboard, harmonica — to make it sound huge. When you listen to “Frozen” and “Heaven in this Hell” there’s a lot going on — there’s violins on “Fire” — so yes, we can do it big or strip it down acoustic. To promote the record — you gonna do a club tour or open for someone? We’re talking about it right now. I’ll be heading back out with Alice towards the end of the year, so before that, we’re talking Japan, Australia and the US. I’ve got some guest spots in the works — with Michael Bolton and others — so I’m trying to figure it all out to see what works. Any chance you’ll guest on the next Allison Iraheta record since your last collaboration (“Don’t Waste The Pretty”) was so fantastic? I heard she has a new record out. She was playing the other night and I wanted to see her show, but I had a show the same night. I would love to do something more with her — she’s amazing. A burning question about “According to You.” I was discussing it during a recent conversation with some readers on Popdose. The song is about what your ex and your current boyfriend think about you — but we never hear what you think of yourself. The whole thing about the song is you want to be treated well. Everyone in a relationship wants to feel they are wanted and not taken for granted. You want it to be mutual — it’s a self-esteem thing. Getting in with a guy who doesn’t treat you well and keeps you down. The song is about stepping away from that and having someone in your life who treats you well. The song concludes with you asking the abusive ex “Why are you making me decide?” Decide what? Please say your character in the song didn’t go back to him. She definitely winds up with the guy who treats her better. Like a lot of people in relationships, it’s hard to break up. At the same time, you have to value yourself and not be brought down by someone who’s controlling. Editor aside: Rihanna — please take note! OK, back to the music — how’s the tour setlist shaping up? We’re picking the rockiest songs off the past records and adding some covers like “Voodoo Child.” I’m looking forward to playing a tour — some clubs around LA and then the US. I went to Japan 10 times in 2010 and 2011. I left a few days before the giant earthquake and haven’t been back so I can’t wait to return. I love the fans over there — the audiences are really enthusiastic. Their TV variety shows are crazy. There’s a really good metal market over there. Japanese audiences love a lot of different genres of music. When we played at Summer Sonic; Dream Theater, Taylor Swift, Stevie Wonder and so many different bands were on the bill. They just love music — it doesn’t matter if you’re country, rock or pop. In the advance copy of your new record, there’s a country radio edit of a song called “Another You.” Are you going to try to position a song to country radio this time around? I am a big fan of country music — since I was like 15. I recorded the album in Nashville, so maybe. This record has a lot of flavors to it, but it’s mainly rock and blues. Rock radio mostly — but if country radio wants to play the song, great. With Heaven in this Hell, you’ve made the record I’ve been hoping Prince would make in the 20 years since he released his guitar-heavy EP “The Undertaker.” I think you’ve captured the beast on this record, I think it’s gonna do really well. I’ve heard you’ve collaborated with Prince — was that on stage or in the studio? We jammed at the Record Plant in LA for about two hours. Sheila E on drums, Prince played bass, I was on guitar. I played him a bunch of demos. We talk about working together in the future. I hope it happens because I’m a big fan of his work. I saw him play the Super Bowl and I think he called me a few days after that. We hung out for four days. I went to his show at the Roosevelt. He’s such a really cool character and amazing musician. I hope we get to do something in the future. Were they rolling tape during that jam session or was it only enjoyed by the three of you? I don’t know. That’s the thing, it’s a studio, there are mics around. You never know. There were quite a few people there. It would be kinda cool to see if there is a recording of that. It was quite a few years ago. He played one of his ideas, I’d play mine — we were just jamming out. 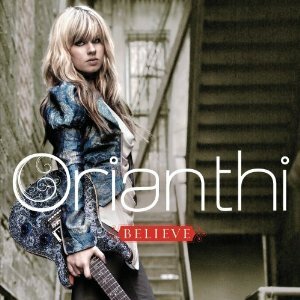 I think you’ve just revealed a new holy grail bootleg for Prince collectors and Orianthi fans to search for. I’m gonna have to ask about that! It’s amazing what finds its way to the Internet — Prince is apparently leaking many of his own rehearsals — like the Welcome to Australia tour via Dr. Funkenberry. He’s such a jammer. When I showed up at the Roosevelt show — he didn’t go on until 3:00 AM — so he asked “did you bring your guitar?” I said, “you didn’t ask me to bring my guitar!” I wasn’t going to be presumptuous but he was like “I want to jam!” I just wanted to see the show. He’s such a showman — and that band! Wow. On the bootleg Small Club — from 1987 or `88 — Prince does a nine minute version of The Temptations’ “Just My Imagination” and launches into a six minute guitar solo that will change your life. I’ve gotta check that out. Thanks for taking the time to talk with us. I can’t wait to get my hands on a physical copy of the CD the day it comes out. Have a great tour! 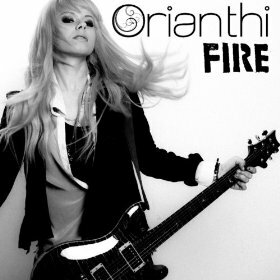 Connect with Orianthi on facebook, twitter and online. You can also preview four of her new songs here. 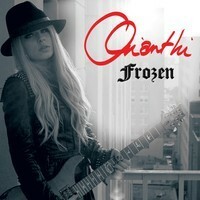 Pick up the first single, “Frozen,” on iTunes and Amazon MP3.